HYDE PARK — A crowd of several hundred people protesting police brutality marched around Chicago's South Side Tuesday night, in a show of strength and solidarity with protesters in Baltimore. The crowd ranged from 100 to 300 people during a rally Tuesday evening at Chicago Police Department headquarters at 35th Street and Michigan Avenue, but it grew as it headed into Hyde Park. Around 7:55 p.m., 100 to 200 of the protesters began marching east on 35th Street, at times yelling: "Back up, back up, we want freedom!" The march then went south on Cottage Grove Avenue. By 9:25 p.m., about 300 marchers were at 55th Street and Drexel Avenue on the University of Chicago campus. 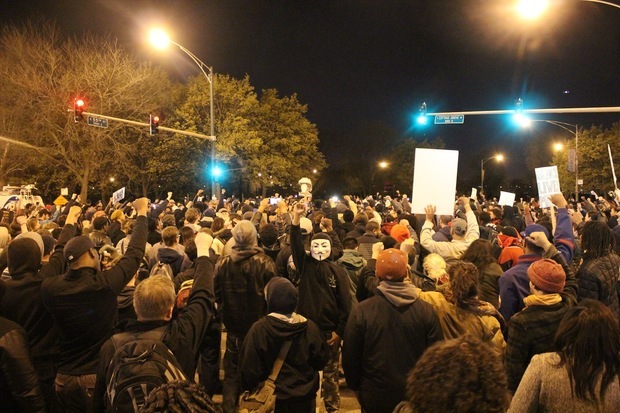 They congregated at 55th and Cottage Grove at 10 p.m. and then marched east on the Midway Plaisance at 10:20 p.m. The protesters formed a giant circle on the Plaisance about 10:30 p.m., and the crowd started to dissipate around 10:45 p.m., with a smaller group heading south on Cottage Grove toward 63rd Street. "All night 30 to 40 officers worked tirelessly to keep us from this [University of Chicago] property," said organizer Malcolm London, who added it was the only property during the march that police cared about protecting. "This doesn't end here," London added. The crowd at one point was just blocks from President Barack Obama's Kenwood home. The president was in Washington, D.C., Tuesday night. As police in Baltimore began to institute a 10 p.m. curfew there, police in Chicago blocked streets in an effort to steer the chanting crowd. The "Emergency Action in Solidarity w/Baltimore" protest, which included Rekia Boyd's brother, Martinez Sutton, began at 6 p.m. at police headquarters. More than 1,700 people said they would be attending, according to the event's Facebook page. "We've been out here fightin' and screamin', and they think it's over," Sutton said Tuesday with tears in his eyes. "[But] there's 12 rounds in a heavyweight battle, [and] I'm just gettin' started." According to the Facebook page, the goal for organizers was to stand in solidarity with Baltimore, where Freddie Gray, a 25-year-old African-American man who died from spinal cord injuries on April 19 while in police custody. "If the gangs can unite in Baltimore, then they can in Chicago," said Erica Taylor, a cousin of Emmett Till. "Where is the outrage from Chicagoans? Our children's blood spills on the street just like in every other state." The group also called for the firing of Chicago Police detective Dante Servin, the 46-year-old officer recently found not guilty after shooting and killing 22-year-old Boyd in 2012 after firing into a crowd of people on the West Side. Sutton earlier said he understands why people in Baltimore are angry. "People want what's right for the life that was lost," he said earlier. "They're calling protesters 'a mob,' 'angry groups,' things like that. When somebody wins a hockey game, it's OK to riot. But when someone loses their life and people react in a negative way, now you have to call out the National Guard. It's mob action." The mysterious circumstances surrounding Gray's death at the hands of police has sparked outrage around a country still reeling from the effects of other recent police killings such as Boyd, Michael Brown and Mya Hall, a transgender woman also killed by Baltimore police, according to the group's event page. "Too many names have been turned into hashtags," the page says. "What is happening in Baltimore is not an isolated event. You cannot critique how black people and people of color deal with the anguish, the frustration, the trauma, the death we experience everyday at the hands of the state, especially if you have never joined in the fight to end this oppression." Meanwhile, Chicago Police Supt. Garry McCarthy announced plans for a "CPD community outreach tour," which he hopes will "help strengthen the relationship between the department and residents we serve." McCarthy himself has vowed to come to some of these meetings, which will include other police leaders, clergy members and community activists. "Over the past year, the issue of the relationship between community members and police has been pushed to the forefront in cities across the country, and this initiative builds on recent efforts in Chicago to open an honest dialogue on this issue," the he said in a news release. Dates and locations for the meetings have not been released.